When Culture Says "Don't Contact Me." Experience One: In a conversation with a church staff member regarding sending notes to contact absent Sunday School members, I was told that one leader refused to make any contact with members because it would be too intrusive. Experience Two: During my daily review of Twitter, I followed a conversation regarding recent statistics about how people respond to personal invitations to church. Obviously, the most important reason people gave about why they might attend church is because a personal friend or family member invited them. This hasn't changed in years. One of the least effective approaches, according to the research, was a door-to-door visit. This wasn't surprising, but the response from some of the Twitterers was surprising; they almost celebrated the fact that they no longer needed to feel guilty about failing to visit someone to invite them to church. I found this very sad. Since when did the church have to stop doing something because some members of our culture didn't like it? Experience Three: Although I am hesitant to bring this one up because it involves my granddaughter whom I mentioned a few weeks ago, I feel I must. 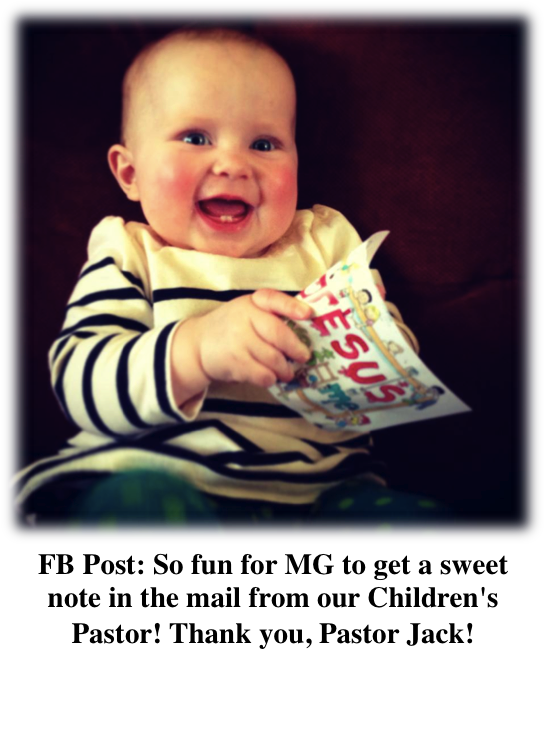 My daughter-in-law posted a picture of MG (our granddaughter) holding a card she received from her children's pastor. Now do you think that was intrusive? Do you think that mom was offended? I don't think so. She told the whole world through Facebook of the ministry of her church to her baby. Beware of bowing to cultural studies in order to justify a lack of commitment to contacting people personally. If we never invite, no-one will be offended, but we will never be able to reach those who would come to our church or to Christ, if we only made the effort. Don't let the culture dictate to you how to live out the Great Commission. We are to go - period. We are to build relationships - period. We need to quit being namby pamby, lazy, and irresponsible regarding our command to go! It will make a difference. Yes, some, maybe many, will not respond, but others definitely will.